Warning: spoilers for Pet Sematary ahead! 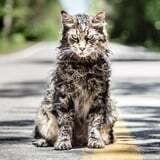 The 2019 remake of Pet Sematary is now busy terrifying a whole new generation of Stephen King fans, but it's technically been giving people nightmares ever since the publication of King's horror novel back in 1983. The modern take on the story follows the same basic story, but it still makes a few shocking changes to its source material. If you're curious about how King's book ends rather than the new twist on the story, we're here to break things down for you. Let's get spooky, shall we? The book begins by introducing us to Louis Creed, a doctor and father of two from Chicago who gets a job opportunity to be director of the University of Maine's campus health service. He and his wife Rachel leap at the opportunity for a more easygoing life and more time to spend with their young kids, Ellie and Gage, and move the family (along with Ellie's cat, Church) to a sprawling rural home in the small town of Ludlow. Although Jud comes off as a little quirky, he and Louis strike up a friendship (Louis lost his father as a very young boy, so there's a bit of a father figure dynamic going on). Their bond hits a snag, however, when Jud takes Louis and his kids on a walk in the woods behind their home to show them an eerie pet cemetery (spelled "pet sematary" since it was painted by kids in town) and Rachel freaks out - she argues with Louis that their kids shouldn't be exposed to death so explicitly at their age, and worries that Ellie might be traumatized by what she saw at the cemetery. Rachel lost her own sister when she was little and never recovered from the trauma, and is scared to see her daughter go through something similar. Louis begins to experience strange supernatural phenomena after a college student, Victor, dies from horrific injuries at his hospital. He dreams of Victor's ghost leading him through the woods, where he warns Louis that he shouldn't go beyond the border of the pet cemetery, "no matter how much you feel you need to." Louis also begins sleepwalking through the woods, waking up with mud and pine needles all over his feet. On Halloween, Jud's wife Norma suffers a heart attack, but is saved by Louis's quick treatment. To repay Louis for his actions, Jud offers to take Louis to the pet cemetery a month later when Church is run over. But rather than bury Church's body there, Jud takes him "beyond," just as Victor warned Louis about, to the "real" cemetery that was once used by a tribe of Native Americans, the Micmacs, who later fled to escape the Wendigo they claimed lived there. The corpses of whatever is buried in this specific plot of land will come back to life within a day, only they act much more aggressive, meaner, evil, or even display cannibalistic traits. Jud hoped that Church might escape that fate, but he indeed comes back as a vicious, reeking, angry shell of his former self. (Jud Crandall, Worse Friend of All Time.) Louis wishes he never buried Church there to begin with, but that all changes when 2-year-old Gage dies after being hit by a truck on the road by their home. Drowning in grief, Louis decides to use the burial ground to bring his son back to life, even though Jud warns him not to. Apparently the last human being who was buried there, Timmy Baterman, came back as a malevolent monster, terrorizing the people of Ludlow. Eventually his father was forced to kill Timmy, and then himself. Jud explains that Timmy might have looked like himself, but that a "demon" had possessed his corpse ("Sometimes, dead is better). He also hints that whatever hellish power fuels the burial ground might have had a hand in orchestrating Gage's death. Louis carries out his plan regardless, but the Gage that returns to the world of the living is demonic, aggressive, and speaks with a different voice. Despite his small size, he's also able to carry out the bloody, gruesome deaths of both Jud and Rachel. Louis finally realizes the error he's made (DUH, dude!) and injects Gage with chemicals from his medical bag, killing his son once and for all. He celebrates by . . . burning Jud's house down and BURYING HIS WIFE'S BODY IN THE EVIL CEMETERY, TOO. Come on, Louis. Because Louis apparently has no brain at all, he thinks that burying his wife's corpse right away will have a different effect on things; that she might return more like herself. Making matters worse is that while all of this has been going on, the land appears to be sapping the energy from Louis, leaving him with white hair and wrinkles. A curious colleague decides to investigate by following him into the woods, but flees in terror after hearing what Louis plans to do. The story wraps up with Louis calmly playing cards back in the house with his back to the door, as Rachel's corpse walks in and places a hand on his shoulder before saying in a scratchy, raspy voice, "Darling." We won't spoil too much about how the new film ends for you here, but since it was in the movie's trailer, we will say that directors Kevin Kölsch and Dennis Widmyer decided to switch out Ellie and Gage's fates. That results in a lot more bloodshed, since 9-year-old Ellie is more physically capable of wielding a scalpel and butcher knife than her 2-year-old brother. That twist, coupled with a number of other interesting (and straight-up bleak) tweaks to King's original horror tale, makes for an ending that's far more depressing than the book - if that's even possible.